Kohima (94.102E 25.658N) was a small village on the main road from the British base at Imphal to the railhead at Dimapur. The Japanese tried to force the road during their 1944 offensive against Imphal, in order to invade Assam, but a stubborn force of British and Indian troops held until relieved by troops of 1 Punjabi Regiment. Meanwhile, the main British forces at Imphal were kept supplied by air, and the Japanese offensive ended in disaster and starvation for thousands of Japanese troops when their logistics collapsed. The village sits at the summit of a pass (elevation 4738' or 1444m), where it is overlooked by a chain of hills, Kohima Ridge, that is the key feature of the terrain. To its west is a 10,000' (3000m) massif while the mountains to the north and east reach 8000' (2440m). The area is heavily forested except for clearings in the immediate area of the village. Battle of Kohima. Slim expected the Japanese to attack Kohima with about a regiment, based on his estimation of Japanese logistical limitations. However, the Japanese threw the entire 31 Division (Sato) at the town in a do-or-die effort to reach the massive supply dump at Dimapur beyond. This became known to Slim on around 27 March 1944 when 50 Indian Parachute Brigade, which had been redeployed northeast of Imphal, captured a set of Japanese plans. 50 Indian Parachute Brigade was itself shattered and forced to fall back on Imphal, leaving Kohima held by a garrison of just 2500 men, of whom only 1500 were combat troops. The combat troops were mostly from the Assam Regiment and Shere Regiment, the latter a force of raw Nepalese recruits. A battalion of Assam troops were deployed well forward at Jessami (94.541E 25.623N) and Kharasom (94.466E 25.453N) as pickets. Fortification of the village was hampered by an administrative rule forbidding the use of barbed wire in Naga country. The forward pickets were driven back on the night of 31 March/1 April 1944. Originally ordered to fight to the last man, the pickets were given permission to retreat, but word never got to Kharasom and the commander there, realizing his situation was hopeless, ordered his men back and fought on by himself until killed. On 5 April 1944 Naga tribesmen friendly to the British reported that the Japanese had reached the Imphal-Kohima road at Mao Songsang. These were troops of 58 Regiment led by the division infantry group commander, Miyazaki Shigesaburo, who had marched 160 miles (260 km) from the Chindwin across ridges reaching as high as 8000' (2440m). The Japanese were now rapidly closing on Kohima. 161 Indian Brigade had been ordered to the village, but the order was countermanded by Stopford when he arrived at Dimapur with the headquarters of XXXIII Corps. Stopford understood that protecting Dimapur was his highest priority. However, both the garrison commander at Kohima and the brigadier of 161 Indian Brigade were furious, the former because he felt his Nagas were being left to the mercy of the Japanese, and the latter because he foresaw that letting the Japanese seize Kohima Ridge would give them a strong position that would be extremely costly to retake later on. However, the arrival of 2 Division (Grover) at Dimapur allowed Stopford to get one battalion of 161 Indian Brigade, 4 Royal West Kents, into Kohima just before the Japanese surrounded it, and the remainder of 161 Indian Brigade took up position at Jostoma 3 miles (5 km) to the west, close enough to provide badly needed artillery support to the Kohima garrison. The Japanese laid siege to the garrison for the next two weeks. The British were restricted to a triangle of just 700 by 900 by 1100 yards (640 by 820 by 1010 meters) where there was no cover for their few artillery pieces and no sure water supply. The Japanese laid low during the day, mortared at dusk and attacked by night, resulting in vicious close quarter fighting. 161 Indian Brigade at Jotsama was itself cut off by a roadblock by 138 Regiment on 8 April. An attack on 9 April failed to drive off the Japanese, and the British were not able to reopen the road until 14 April. Early on 18 April the Japanese succeeded in cutting the Kohima garrison in two, and the British expected to be overwhelmed at any moment. However, no further Japanese attack developed, and that same day 161 Indian Brigade was able to push 1/1 Punjab Battalion and a detachment of tanks into Kohima and lift the siege. 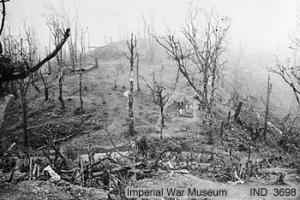 By 20 April the Japanese in Kohima and the surrounding hills were thrown on the defensive. Stopford had 161 Indian Brigade in the town itself; 7 Indian Division (Messervy) coming down from the north after having been airlifted in from Arakan; 23 Long Range Penetration Brigade in the Japanese rear interfering with Japanese supply lines; and 2 Division preparing to storm Kohima Ridge and reopen the road to Imphal. Grover sent 5 Brigade on a wide flanking movement to the north that put the brigade in the rear of 124 Regiment in the western part of Naga village, northwest of Kohima Ridge. The battle was vicious and bloody. The Japanese had already built formidable bunkers throughout the areas they controlled, and had to be blasted out by tanks and artillery. Nothing short of a 5.5" artillery shell or a 75mm tank round fired at close range could take out a bunker. However, on 13 May elements of 2 Division cleared the last Japanese positions on Kohima Ridge. The Japanese still held Naga village northeast of Kohima Ridge and Aradura Spur south of it. 4 Brigade made a flanking maneuver to the right around Mount Pulebadze and came out of the jungle on 4 May to the rear of the Japanese on GPT Ridge (south of Kohima Ridge). Their commander ordered an immediate attack to take advantage of surprise rather than wait to call in preplanned artillery fire. Though most of the ridge was taken, a few bunkers held out, and these threatened the advance on Naga village and had to be cleared. The assault by 33 Indian Brigade began on 4 May and the bunkers were not cleared until 11 May. By this time there were enough British troops in the area for Stopford to rotate exhausted brigades out of the line from time to time for a few days' rest in Dimapur. The Japanese, by contrast, had no reinforcements, no air support, and no tanks. Nevertheless, they still put up ferocious resistance to Stopford's renewed assault to take the remaining positions around Kohima on 16 May. But the Japanese had run out of their original issue of rations on 5 April, and almost no supplies were getting through. Just two Japanese supply convoys carrying mostly artillery rounds made it to Kohima, and while Miyazaki had made a point of treating the Naga natives along his route of march well, so that they would willingly provide food to his foragers, almost none of this reached Sato at division headquarters. Most of the Nagas remained loyal to the British, and together with the Chindits, they put considerable pressure on Sato's lines of communication. On 17 April 1944, Sato had received an order from Mutaguchi to take Kohima by 29 April and then send three battalions to the Imphal front. Sato responded to the order with mokusatsu, contemptuous silence, but when the order was repeated he replied that it was impossible. On 25 May Sato was informed that all the available transport for 15 Army was committed to bringing reinforcements to 33 Division and there would be no supplies for 31 Division. Sato was determined to save his men from annihilation and signaled 15 Army that he was going to withdraw to a point where his men could be resupplied. When Sato received a farewell message from one of his regimental commanders at Kohima on 31 May he gave the order for the entire division to retreat. The battle of Kohima was over.